Approximately 95% of the American population suffers from a clenching or grinding condition at some point in their lives, however most people are unaware of the condition. 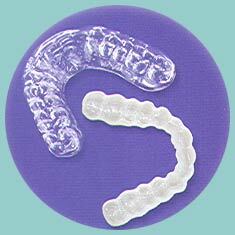 Porcelain restorations can renew a smile that has been severely damaged by clenching or grinding. However, if the condition is diagnosed early enough, the damage to your teeth can be slowed or prevented completely by the use of a bite splint, also referred to as a nightguard or mouthguard. A bite splint is a hard or soft appliance that fits onto your teeth and keeps them from coming into contact with each other if you grind or clench, thereby preventing tooth damage. These mouthguards are removable appliances that can be worn at night while sleeping. Some people even chose to wear them during the day, particularly during times of stress. 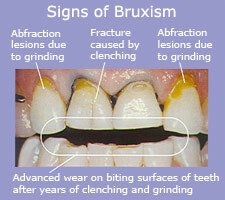 No other treatment protects the teeth during grinding and clenching as well, or as inexpensively, as a bite splint.